I wasn’t going to call this dish a smörgåsbord, because it’s not exactly the right definition, but it is a sharing platter with plenty of Scandinavian flavours so I hope I can get away with it. 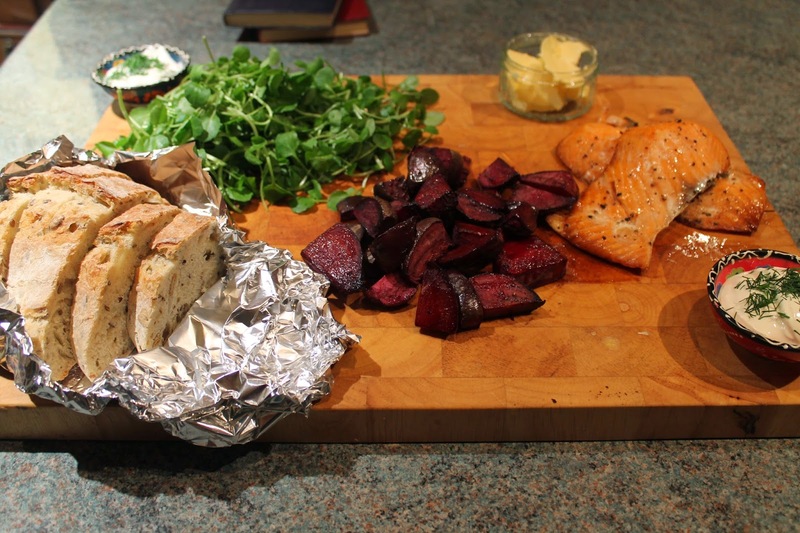 This is so simple, barely any cooking is required (any use of the oven is just for warming things up, apart from the beetroot which needs roasting) and it’s really just a case of compiling the ingredients. You could add or remove various ingredients to this – if you had any gherkins they would go well on the side, as would a dollop of horseradish sauce or some pickled fish. Use your imagination! I love the fact you can put this in the middle of the table and let everyone help themselves; just make sure you get to go first! This will serve 2-3 and is ready in 30 minutes. 2 smoked salmon fillets (I used lightly smoked which meant they needed cooking, if you’re using fully smoked you don’t need to cook them). 1. Preheat the oven to 180 degrees. Drizzle half of the olive oil over the beetroot in a roasting dish (trimmed and cut into wedges; no need to peel it) and sprinkle with salt and pepper. Put in the oven for 30 minutes. 2. When the beetroot has been in for 15 minutes, put the salmon in an oven proof dish and drizzle with the rest of the olive oil. Put in the oven for the remaining cooking time. 3. 5 minutes before the end of the cooking time, put the loaf of bread in the oven. 4. Chop the dill and mix with the soured cream in a small bowl. 5. To serve, load all of the ingredients onto a large board or tray, and let everyone tuck in. Excellent alternative to the cheese board!